Dental phobia, also known as dental fear and dental anxiety, is actually fairly common. It is often brought on by psychological trauma brought on by comments, such as “if you don’t brush your teeth, you’ll have to go to the dentist,” or it is triggered by a physical event, such as a painful incident at the dentist’s office as a child. These emotional experiences linger, causing anxiety that can carry over into adulthood. However, with new advancements in dental technology, going to the dentist has become virtually painless. New Dental Tools: For example, needles used to inject numbing agents have gone from large and reusable (repeated use dulls a needle’s point) to ultra-thin and disposable. Topical Anesthetics / Dental Patches: Topical anesthetic gels and dental patches can be used to numb the gums to keep patients comfortable during injections and deep cleanings. Sedation Dentistry: Sedation Dentistry has been used safely for over 30 years, providing a relaxing and anxiety-free experience dental experience for patients just like you! On the day of your appointment, you will take a pill which will relax you. Our specially trained team members will ensure that you are comfortable and relaxed. During the dental visit you will be monitored closely. After your dental treatment is complete there will be minimal if any discomfort. Also, you will have little or no memory of your visit. If you have any questions about Dental Phobia, Sedation Dentistry, or wish to schedule an appointment, please contact Leikin & Baylin Dental Care of Catonsville, Maryland by calling 410-747-1115 or visit CatonsvilleDentalCare.com. You can also follow us on Facebook, Twitter, and Google+. I just want to let everyone know that all the Dentists at our practice Dr. Scott Levy, Dr. Edward Leikin and Dr. Scott Baylin have completed advanced training in our state of the art CEREC Milling Machine. This high tech marvel is at the cutting edge of the dental profession. If you have any questions about it or would like to see it when you come in for your next appointment just let one of us know and we will be happy to show you . 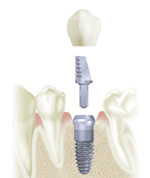 Implants : Start to finish in our office ! Your teeth were designed to last a lifetime, but sometimes they don’t! Replacing missing teeth is important to your general health and to the health of your other teeth. Not only do you lose chewing ability when a tooth is lost, but unreplaced teeth can cause other teeth to be lost, tipped or crowded and create subsequent problems. Also, there are the obvious problems of poor appearance and loss of self-esteem caused by one or more missing teeth. Dental implants are substitutes for the roots of missing teeth. They act as an anchor for a replacement tooth or “crown” or a set of replacement teeth. Am I a candidate for a dental implant? Implant patients are of all ages and implants may be the right choice for anyone missing one or more or even all of their teeth due to injury, disease or decay. They are especially practical for patients who can no longer wear removable dentures. Your dentist can determine if you are a candidate for dental implants after a careful evaluation of your dental and medical history. Are there different kinds of implants? There are many shapes, sizes and brands of implants available. Your dentist will know which implant is the right one for you. It is important for a patient to have enough bone to support the implant. If you do not have enough bone, there are many safe and effective ways to correct bone deficiency. Your dentist will assess this and advise you if additional bone material is needed. Will this take a long time? Treatment time can vary greatly depending on your needs. Each situation needs a separate evaluation; your dentist will be able to give you an approximate timetable. Whom should I consult for my implant treatment? Your general dentist is your first resource for this service. The key is the implant dentist’s training, experience and credentials. Less time in the chair with CEREC Crowns/Onlays! Over the course of the past two years we have implemented a truly awesome technology into our office. We now have the capability to take a picture of your tooth and have an in-office milling machine make your custom made crown/onlay in about 15 minutes. The major advantage of this procedure is that it only takes one appointment instead of two ! Heres a video clip of how it works!